The weekend before last, I took on another livestock guardian dog. 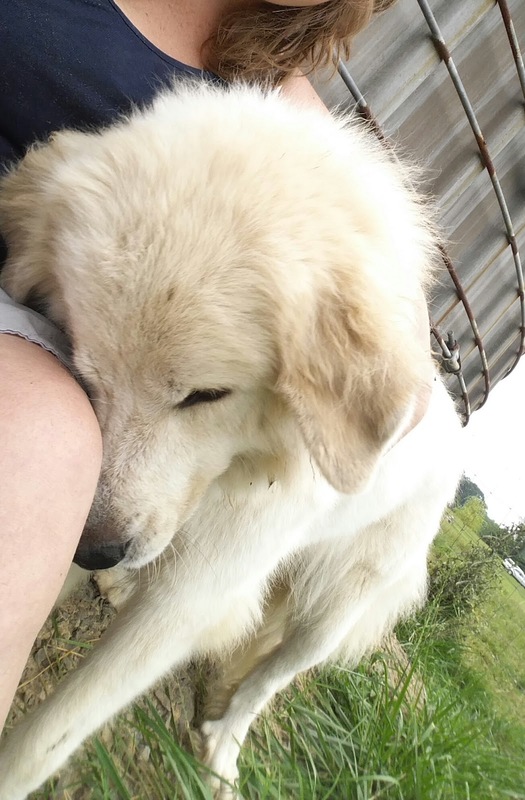 This girl is yet another, Great Pyrenees. I will not go into her history, much about how the dogs respond to me and the world around them is really all the info that needs to be told. Every guardian that comes here, starts with a clean slate. For them to move on, the past must be forgotten. They are given new names and a new start on life, I often reference it to being reborn. 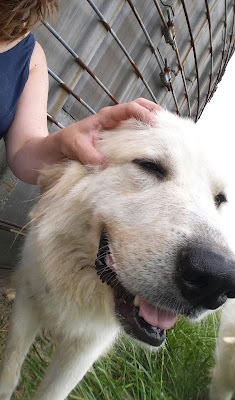 I get calls & emails often with Pyrs that are needing to be rehomed. Most by families that saw this precious little white fluffy puppy and thought they just had to have it. Puppies grow up. Little fluffy pups become big high maintenance dogs with breed specific personalities and families are quickly overwhelmed. 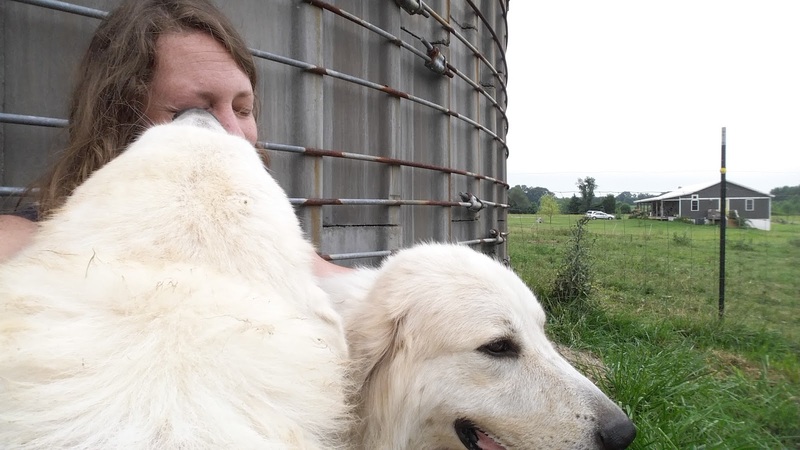 And a Pyr is a breed all of its own. All breeds truly are. None are just like the other. I can't say I look forward to these calls or emails but with no doubt, I know it's a responsibility. I willingly take it because I am capable and because these dogs deserve another chance. This is in no way about me. This is about them. And I blog and post about it as much as I can because these dogs, they need their voices to be heard. To relearn is an incredible amount of work for each and every one of them. The day we picked up this girl, the hubby and I both were bit multiple times. Fearful and not easily comforted, she would lash out and refused to be touched or handled in any way. She did not enjoy the company of other dogs or livestock. She preferred solitude and being completely solo, as everything else seemed to sorely tick her off. Angry, afraid and underweight. She was not happy about anything. But she would chow down at meal time and was not picky about anything I put in her bowl. So my new girl is easily bribed with food - and I have found my little light in a long dark tunnel. The first few days I likely fed her a hundred treats. No exaggeration. I must be able to handle this girl if we are ever going to be successful. She is not spayed so my next concern is getting her vetted but first..I must be able to handle her. This priority was weighing heavy on my mind. So I fed her. A lot. By about the 5th day, she began taking a treat from my hand before retreating to finish it off by herself. HUGE progress and my heart smiled. But still I could not touch her without being bit. That first week, I was bit more times then I could count but never did I speak harshly to her or react whenever I was bitten. It is never fun to be bit. And it takes complete control over your own emotions in a circumstance like this and for me to react would be to completely undo everything we had been working on up until this point. So I must remain calm and go on. She has no connection with me and so to correct her now would only alienate her even more. There may come a time that I may have to let her know, that biting is not what we do. Time will tell. But the time is most definitely not now. And with this girl, I am hopeful that by offering her a new perspective and change, it will also change that harsh reactive behavior. After all, if I expect her to not react, I must show her that I too will not harshly react. 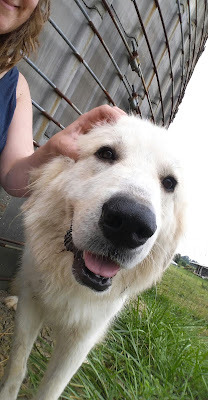 By this time, I have also decided to give my young Pyr pup, Wren J free run of the new girl's paddock. It seemed to me this new girl needed some company and to know that not all company is bad. She would not willingly choose to be around another dog, so my Wren J willingly chose to be around her. Wren J is a jolly, free spirit. She rolls on her belly in front of the new girl and completely submits to her every snarl and stare. Good girl Wren J. It's a good first fit and so some socializing begins. At day 6, 7 and 8. I continue my efforts to win the new girl's trust. The snapping slows and by day 8, I am not able to touch her head but I am able to rub her belly as she stands near me. Daily I sit in with the new girl and Wren J, I hand out treats and rubs where ever I am able. And Wren J shows the new girl how loving and dependable the shepherd is. It doesn't matter if it's raining or one hundred degrees or if the sun isn't even up just yet, the shepherd is there. I have found a dog loves consistency and can be taught so much through it. So here I am on day 9, sitting in the same spot with tasty treats and the same hands offering love to whoever is ready for it. The new girl without skipping a beat, comes in under my hand. So I without skipping a beat begin softly massaging, no stroking motions just yet. I do not lift my hand away, my fingers are kept at the same amount of pressure as I massage for a good amount of time. She lays her head on my lap and with her chest touching my thigh, I can feel her heat beating. She was calm and relaxed. I pulled my hand away and she nudged me with her nose, to continue. So I began stroking her thick burly mane. As I ran my hand over her collar, she turned quickly and looked dead straight into my eyes. Her collar an obvious sensitive point on her body. By this time, my cheeks were soaked with tears, I was completely vulnerable and all hers. Wren J knows my heart well, this isn't the first or the last time she will see her shepherd vulnerable or crying. So the big silly floppy girl steps over, sits at my feet and begins gently licking each and every salty tear until there was more Wren J slobber on my face then anything else. Wren J's compassion also offered some loving interference. And another milestone was made. The new girl settled in a little closer to my side. I put my arm around her, stroking her belly, her back, her neck and chest. Her fear released, her anger was gone and she melted right into my arms. A sweet and willing surrender. We still have much to do and much to learn but a long way this girl has come in 9 days. This girl did come with a name but I have renamed her Daya, which is a reminder to us both to take this new journey, one day at a time. So big ole world, meet my new brown eyed love, Daya girl. Pack of 2 Children's Books. Recommended for ages 4-100. 20 pages each book. Soft cover. Real life colored photos. Simple reading text for beginners. A simple inspiring tale of a little lamb born on a frozen winter's morning, his fight to survive and how he didn't just beat the odds stacked against him, he flourished. Written & photographed by Suzanne Benson-Gonzalez, shepherd at Cedar Springs Farm & Dairy LLC. $19.75 - Price includes shipping. Shipping in US only.